STICKY: Technical questions and tips! Hey folks - this is the thread for asking any questions about how the community software works, things like changing your avatar, connecting your Twitter account, adding pictures to your posts and so on. If you have a question to ask or a tip to offer, please post it here. Just a few tips for new members! You can centre them as above just by selecting the text of your link and using the rich text editing buttons. then just drop the image you'd like to add, or click the 'Select file' button to choose it from a file folder. You can also align images using the left, centre and right text align buttons. 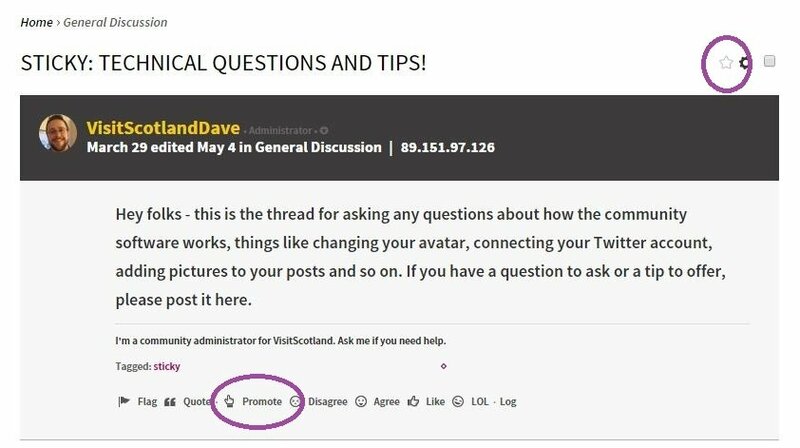 If you have any questions about using I Know Scotland Online, please post them in here. If you want to save a discussion so that you can find it quickly in the future, you can "favourite" it by clicking the small yellow star (highlighted below). All of your favourite posts are saved, and you can get to them by clicking on the star in the header of the site, just to the right of your username. If a particular comment strikes you as worthy of being seen by more people, you can hit the "promote" button for that comment. Top content appears on the "Best of..." page, which you can also get to from the main menu at the top of site. We'll continue to develop and improve the forum over the coming months, so it's always good to get feedback from the community members!